My German friends frequently ask me how I like living in London. My answers are highly dependent on my current mood and my recent experiences. One thing is for sure: In certain respects it’s definitely better to be a tourist in London than an inhabitant. However, even when I’m completely fed up, there is one thing I always praise. It’s the FNRttC. The “Friday Night Ride to the Coast”. That`s probably one of the weirdest bike rides in the world. And most definitely one of the greatest. Today (March 18th, 2011), the night riding season finally starts again . 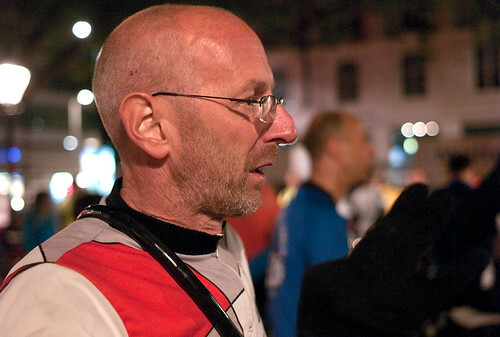 Around 11.30pm, more than 100 cyclists will meet at Hyde Park Corner. At 12pm sharp the group is going to leave – we’ll be heading towards Southend on Sea (around 55 miles). Southend is the shortest and most easiest ride but perfect for this time of the year. I’ve been looking forward to this for several months. There are some lovely rides from London, particularly on Fridays, around the full moon. This lead me to videos Andy’s making about the rides. After I had understood what it’s all about it immediately became clear to me that I MUST take part in one of this rides. Why? My intial motivation was: Just because it’s so weird. I have been an avid cyclist for years. However, I’ve never felt inclined to ride at night. Back in Germany I’d never heard about anybody doing anything like this. Kent at dawn. Have you seen this before? My first night ride was horrendous. It took place in February 2010, and we went to Brighton which is a rather long and hilly ride. I was nervous, I knew nobody and I felt a little bit lonely. It was terribly cold and raining like hell. I had not cycled much beforehand and was not fit at all. Even today I don’t completely know how I made it to Brighton. The full English breakfast at the seaside, however, was terrific. On the train back to London I felt really good. I was on six FNRttC last year and would have loved to do more. What’s so special about it? It’s not only that it’s weird. The night rides are the most intensive bike rides I’ve ever experienced. It’s like stepping in a different dimension: The ride begins when the first pub dwellers are heading home. At 6am you’re feeling like it’s really late (albeit in fact it’s utterly early). When you’re home at 11am you feel like you really have to go to bed. It’s like being on an intercontinental flight: your’re completely losing your track of time. Additionally, cycling at night is like seeing the country from an airplane. The scenery completely changes. You know it’s the same area, but it feels completely different. The why is simplicity itself. If you live in southern England and hanker after quiet roads and good company, then you’ve got to look beyond those clever maps with wiggly green lines denoting roads that are crammed with 4x4s stuffed with ruddy-faced commuters, children being ferried to rugby practice and families on their way to the garden centre. So that hankering will seek not just the place, but the time. And the time is that magic interlude between cars: the seven hours between chucking out and opening up. Before my first ride I was terribly worried about getting tired on the way. Interestingly, that’s not an issue at all. I was tired afterwards but not en route. The entire endeavour is meticulously well organised (even from the perspective of a son of a German engineer). Every junction is marked by riders and tail-end Charlies make sure that no one is left behind. The solidarity on the ride is fabulous, and newcomers receive a very warm welcome. Miraculously, Simon always manages to persuade an owner of a café located half way to open its doors for a bunch of cyclists around 3.30am in the morning. Having a coffee and a hot sandwich at that point of the “day“ is a wonderful treat. The best thing, however, is the beer at home. At 11am. And you don’t even have to feel bad about it. Medical Warning: FNRttC are highly addictive and might lead to temporary sleep deprivation. Technical Note: If you’re interested in taking part of that wonderful ride, have a look here: http://fnrttc.blogspot.com Please be aware that you have to register in advance. One a year, there is ahttp://fnrttc.blogspot.com/ The next one will be on September 2nd, 2011. 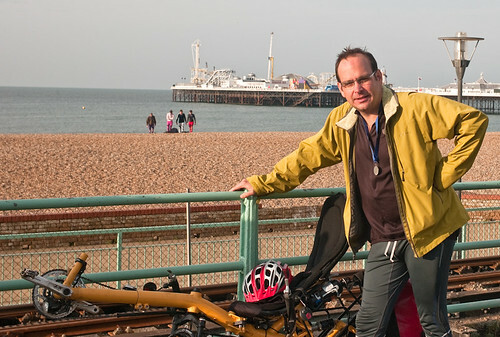 This year Simon is aiming for 1000 riders and is hoping to raise £ 100,000 for the hospice. Get on your bike and be a part of it! I’ve made it to Brighton! 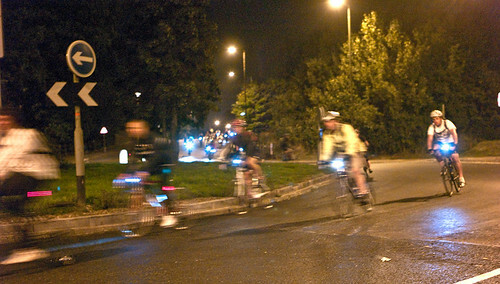 Update: On June 11th, 2011, there is another night ride in London called “Nightrider”. It’s a charity ride supporting the Lymphoma Association. Cycling in London – How dangerous is it? Am so looking forward to returning to the FNRttC soon. Metcheck says the weather is due to clear up shortly and stay good all night. I’ll do the ride on the Brompton, by the way. I’ve noticed on Wednesday that the handlebar on the Grashopper is a little bit twisted. I won’t take any chances so I’ll buy a new one. As long as we are in tweeds: Otherwise it’d be just silly. The most likely explanation is that it requires a critical mass of excentrical people to get something like this going. That’s where the English are really good at. 🙂 (In earnest, first and foremost you need somebody like Simon Legg who is willing to spend an outrageous amount of this time for organising the rides). I’m sure that such a ride would find its audience in Germany. You’re right about the full moon – the FNRttC are taking place on full moon nights as well. I consider getting up at 4am for doing a ride before lunch much harder than starting at 12pm BTW. The trick is NOT sleeping before the ride.